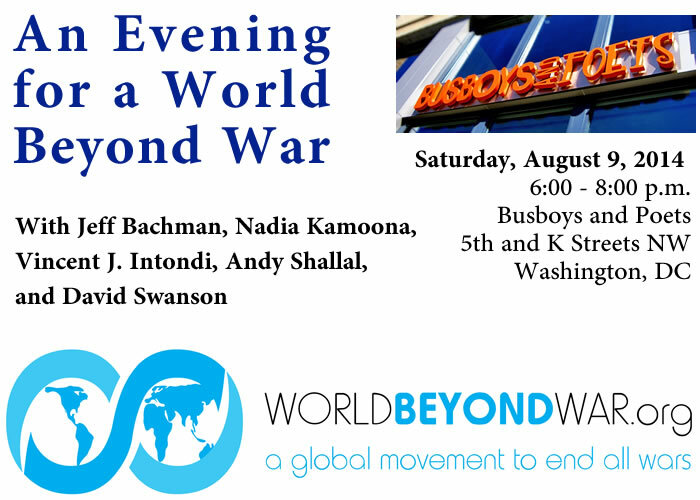 A fundraising event for a global campaign to end all war. Buttons for all, scarves and books and other tokens of gratitude for larger donations. Jeff Bachman, Professorial Lecturer in Human Rights and the Co-Director of the Ethics, Peace and Global Affairs program at the School of International Service at American University. Nadia Kamoona, Iraqi-American student at the University of Virginia, future international human rights lawyer, and current intern for World Beyond War. Vincent J. Intondi, Associate Professor of History at Montgomery College and Director of Research at the Nuclear Studies Institute of the American University in Washington, D.C., also author of African Americans Against the Bomb. Anas "Andy" Shallal, Iraqi-American artist, activist, and entrepreneur, proprietor of Busboys and Poets, and recent candidate for mayor of Washington, D.C.
David Swanson, Director of World Beyond War, host of Talk Nation Radio, author of books including War No More: The Case for Abolition, War Is A Lie, and When the World Outlawed War.